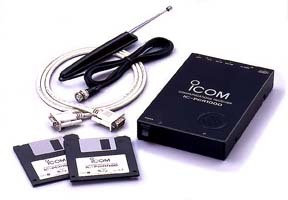 I’ve just got a second hand Icom IC-PCR1000 communications receiver and needed to get it working with Linux Mint. What’s unique to this receiver is that its a standalone unit which connects to a computer via RS232C (it dates from 1999) and covers the entire 10kHz to 1300MHz range (there is a US version which has US mobile frequencies blocked). Now obviously most modern computers don’t have native serial ports these days so I’m using a USB-Serial adapter to connect it. So to get it working with Linux. First ignore the floppies – they only contain software for Windows and even if you wanted to use it, the contents are available online anyhow. Next plug it in to your Linux box. You’ll need a standard mini-plug audio cable which you’ll plug in to the Ext-SP socket on the radio and the other end into either Line-In or Microphone (some systems they are the same one). /dev/ttyUSB0 is the USB-Serial port. -v is the volume in hexadecimal, so 00 is off, ff is full on. 89.100 is BBC Radio 2 here in the South East of the UK. That’s effectively all that’s needed, sort of. You should see a microphone icon appear next to the clock and, hopefully, the audio being fed through to the speakers.